PROPERTY OVERVIEW >> $898pw -- Price incl. Bright and fully equipped office space for rent in Kings Cross close to the iconic Coca-Cola sign. This workspace sits on the first floor of a three-level building and boasts abundant natural light and a relaxed creative fit-out. There are eight spacious desks in the office plus a meeting area and large windows overlooking the busy William Street. Polished timber floors, high ceilings, whitewashed walls and vintage features contribute to a stylish distressed vibe that creatives will love. The Darlinghurst workspace is accessible 24/7 and has its own on-floor kitchenette and bathroom. Exciting flexible options are available whether you want to rent the entire floor or just a few desks. Please enquire to explore the possibilities – short and long term rent available now. 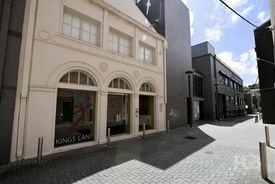 This small heritage building is located on the high traffic William Street in the heart of Kings Cross. 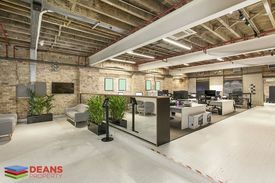 Shoulder to shoulder with A grade office developments in a prime CBD fringe location, it gives tenants the chance to secure a sought-after position without needing to move into a cookie-cutter corporate workspace. The building has three floors of light-filled creative space with a retail store on the ground floor, the advertised workspace on the second level and the office of a boutique property development firm on the top floor. It is air conditioned, accessible by staircase and pet-friendly. Located just steps from the Kings Cross Coca-Cola sign, it grants a lively atmosphere close to Kings Cross’ famous nightlife and great restaurants. Within walking distance of Kings Cross Station, Hyde Park, the Botanic Gardens and Surry Hills, this desirable address is also accessible for every commute.